As I listened to the abridged version of the audioBook, some of my experiences with this book might be different from if I had read the full version of the book. What I have noticed with this abridged audioBook (and others), is that if you miss one sentence, you could easily miss a plot change. A reason I won’t be getting any new abridged audioBooks anymore. A full audioBook discussion will surely be coming up in the future. The book itself was a nice mix of sci-fi/fantasy elements. A technological explanation for ‘magical’ powers (although not a scientifically valid one). 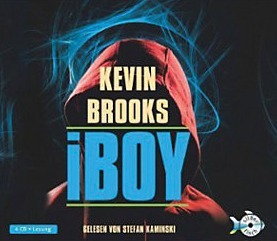 I really enjoyed exploring the powers with the main character and his decision to become a ‘superhero’, with a superhero name: iBoy. I also appreciated his relationship to his friend, especially after the incident (calling it that to avoid spoilers, not to negate how horrible it was). He was kind, listened, and tried to do the best he could, not immediately jumping to revenge (as is all to often done in books and real-life). The events in the book itself weren’t as fascinating or interesting as they could have been; they didn’t really grasp me. Mostly they seemed a bit bland. I’m not sure if that’s due to the fact that it was an abridged version or not. Sunday Post #37 – I’ll get the hang of this blogging/job thing one day!